Backlit keys and 1000Hz polling rate make this gaming keyboard growl. 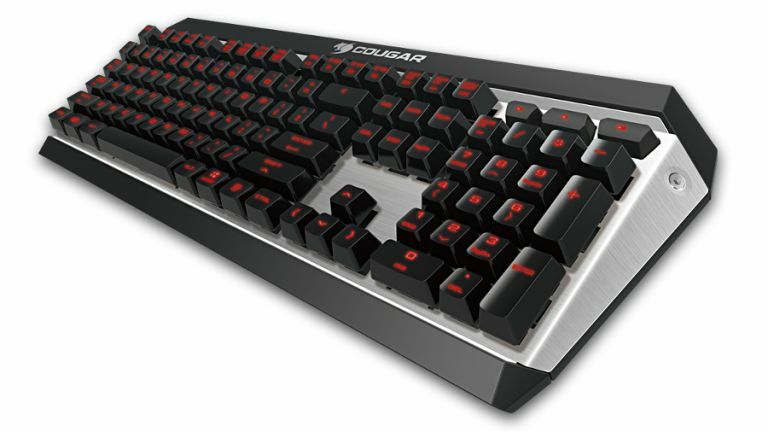 Cougar is launching a new mechanical keyboard aimed at gamers seeking an ultra-responsive peripheral with a durable design. The Cougar Attack X3 (there's a dynamic name if we ever saw one) uses Cherry MX mechanical switches for tactile feedback and responsiveness, coupled with a 1000Hz polling rate to ensure that when you hit that key to strafe left, you dodge near-instantly in that direction. The backlit Cherry MX keys are also rated to last a guaranteed 15 million keystrokes, and the keyboard's N-Key Rollover feature allows for any number of keys to be pressed simultaneously, and they'll all still be registered. The Attack X3's aluminium frame is said to be plenty durable, as are its keys, and it looks quite tasty too being fashioned from a chunk of metal. It also boasts UIX System software that allows the user to define the function of any key, and to customise up to 10 macro keys. You can set up three different configuration profiles which are stored in the on-board memory, and these can be accessed no matter what computer you are using (if you happen to take the keyboard over to a friend's house, for example). You also get anti-slip rubber feet, five levels of brightness for the red backlighting, and dedicated media keys to allow for easy control of your music and video playback. The Cougar Attack X3 goes on sale later this month in Europe, and in the first quarter of next year over in the US where it will retail at $120 (£80) not including VAT. The UK price is yet to be confirmed.